Disney has made a lot of movies. Movies that take place in France, under the sea (by Denmark), Baghdad, Germany. And in 1995 one finally took place in the United States. Finally, we got the animated film Pocahontas. The classic music, the adorable Meeko the raccoon, and Flit the ruby-throated hummingbird. And there are more memorable characters, too, like wise old Grandmother Willow with her guiding words like "all around you are spirits, child. They live in the earth, water, sky if you listen they will guide you." Those are words to live by. And we'll take it because of the beautiful artwork completed by the Disney animators. 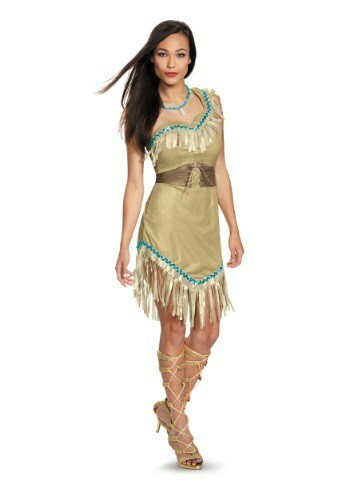 So if you want to be a Disney princess this year try this Women's Deluxe Pocahontas Costume. It features the asymmetrical design of the dress that the animators came up with for the film. It includes the beautiful turquoise colored necklace like Pocahontas wears in the film. You'll be ready to sing Just Around the Riverbend when you wear this official costume. Nice and is exactly as shown in picture, ordered 8-10 for daughter but should have gone smaller.